Wave and tidal energy firms are warning that changes in government support may force them to take jobs and investment overseas. They say the UK government's switch to a system known as Contracts for Difference leaves them without access to ring-fenced support. They claim it fails to recognise the extra costs of new technologies. The Department for Business, Energy & Industrial Strategy (BEIS) said it has to ensure best value for consumers. Under the Contracts for Difference scheme, power generators compete to secure a minimum price guarantee by offering the lowest price they can. But some in the marine renewables sector argue it still requires ring-fenced subsidies, as the technology develops. James Murray from Scotrenewables told BBC Radio Orkney: "Other countries now are starting to recognise the benefits of supporting the early stages of the industry. "Countries such as France and Canada have put in place appropriate levels of revenue support for first array projects. "It would be a terrible shame, but it does look like unless the UK government changes its mind that we might have to do our first commercial projects there instead." Scottish Renewables, the body which represents a range of companies in the sector, said the industry was lobbying to get the government to set aside money for new and emerging renewables. "So we've got this fantastic industry right there on our doorsteps, that's really getting to the point that it's just at commercialisation. "Of course, other countries around the world see this and maybe want a piece of the pie. So without the right support to get these technologies through to market there perhaps is a risk that others could try and sweep some of that up." The industry says it has happened before, when the UK lost its lead in onshore wind turbines to Denmark. And they point to the recent success of offshore wind in cutting its costs to half the level of two years ago as an example of what can be achieved with appropriate support. But a spokesman for BEIS said: "The UK government is a leader in providing support for renewable technologies and has committed up to £557 million for further clean electricity auctions. 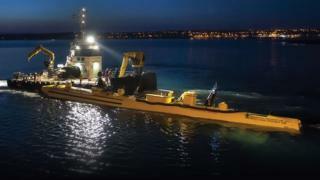 "Wave and tidal stream technologies could participate in the latest auction but we didn't ring-fence budget for them at the expense of other, potentially less expensive technologies. This meant we brought forward over 3GW of clean electricity while ensuring the best value for money for consumers. "We will continue to work with the marine industry to examine ways to reduce the cost of this technology."